Click title for further images. States of Being explores making as a spiritual practice. Drawing influence from zen Buddhism and western mindfulness practices, mental processes are put aside in the moment of making in favour of the intuitive body and the phenomenological experience of clay. The emergent forms are simply glazed with different combinations of white underglazes and slips or left partially unglazed to reveal the natural body of the clay. Each piece representing a union of the mental, physical and spiritual state of being. This collection was exhibited at Mount Florida Gallery, Glasgow on 14 - 15 July 2018. 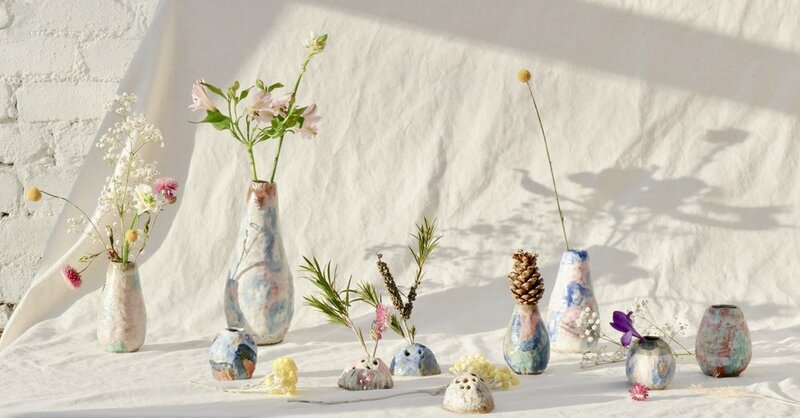 A collection of hand built vases and flower frogs inspired by the instinctive and playful creativity of the natural world. Each piece is intuitively made using a coarse stoneware clay and shaped with found natural objects gathered from woodland walks, creating a highly textured and sensorial surface. In contrast to the slow process of hand-building, the dynamic forms and colours in nature are captured through the use of slips and glazes, which are layered and applied quickly and spontaneously. This collection is stocked online and at the Welcome Home Store in Glasgow, Scotland.